A cute quilt and a great panto! I finished quilting this little gem of a quilt last night after work. It is a customer top, made by my good friend, Betty. She did a great job on this one, and chose the Star Swirl panto, from Terri Watson & Michelle Wyman. I love this panto, it quilts up quick & easy, & looks great. This top and backing were made from unwashed batiks, so I was a little apprehensive, but Corky handled it great. I had one spot I had to pick out and restitch, because it skipped some stitches. I’m not sure what caused it, but I thought about all the tips I have read and decided to loosen the quilt sandwich a bit more, and I didn’t have any more problems. It was one little spot, about 1/2 inch long where there was one long stitch. 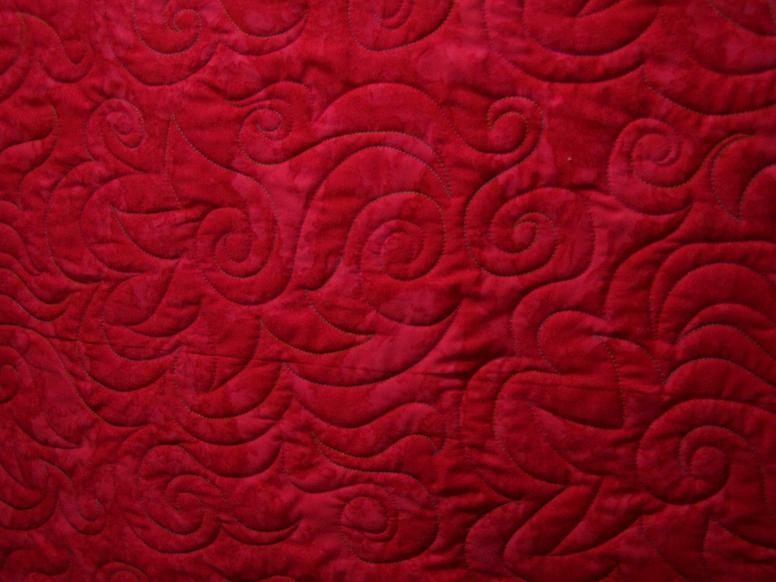 The backing is a gorgeous red batik, and I had trouble getting a good photo of it, but the pattern and variegated thread look fabulous on it. I think Betty will really like it. The next quilt to go on the machine is my cousin’s log cabin, with the cattle brand in the center. I’m anxious to get started on it. 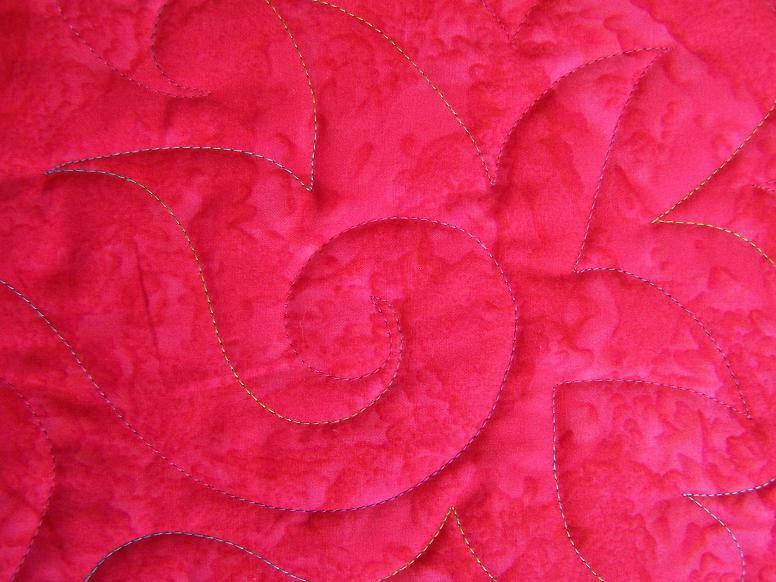 I hope this weekend will be good for quilting! Hopefully my body will be on the same page as my mind, and be cooperative! Oh that’s beautiful!! She is going to love it!! Love those batiks 😀 Here’s hoping you get to start on the cattle brand quilt. I can’t wait to see it quilted!! Go Randi!! It’s really pretty! I love the fabrics in the quilt and that panto is always a good one to use. Looks beautiful Randi! The pattern looks perfect on it. Great job, she’ll love it! Can’t wait to see what you do with the cattle brand quilt. 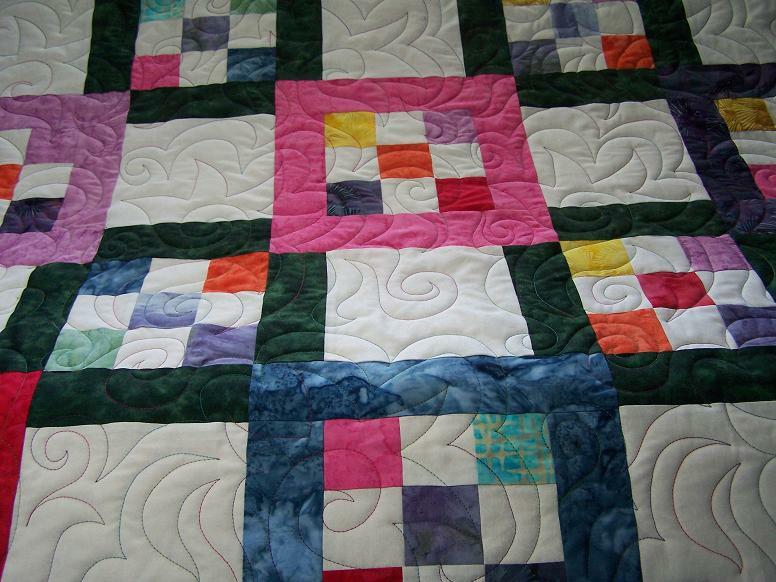 The pattern and fabrics are really cool and your quilting sets it all off. I’ve learned too to keep that sandwich pretty loose – especially with the batik backs. Gorgeous!! That has become one of my favorite pantos, I’ve had a lot of customers choose it lately too.